I knew that I wanted to be involved with an educational games project somehow this semester. I thought I might add a lesson plan to TeachWithPortals, or otherwise re-appropriate another game to fit what I needed. I did not think I would be involved in helping create a game. When Alex had mentioned the project to me, I was immediately interested, though I had no idea how it would turn out. We knew that the game would involve chivalry/romantic tropes, would play with those ideas somehow, and would be “serious” – that is, an experience that was intended to be used academically (though hopefully, enjoyable by all). We began by sharing a few interactive fictions and talked about them. I was less familiar with the field, so Alex provided most of the sample games for me. When we began to discuss what we found effective in each game, I found myself focusing on form—what moves do these games make in terms of visuals, pacing, text-animations etc., which we can use in our game. Alex seemed focused on content. I think our two different focuses here really helped the game get started, that is, once we realized we were coming from two different directions. Though I have put in quite a few hours, I feel that Alex has done much more important work: providing the content that drives that game. My experience thus far has been primarily programming. It’s been mostly hours of trial-and-error. Hours of frustrating moments trying to do one small thing, like transitions, and finding that you were missing something that was so obvious no tutorial ever mentioned it. Lots of triumphs—awesome moments when that page snaps in just right, and the elements fall together–and lots of agonizing failures when code just doesn’t want to cooperate. Anyone who has dealt with code can relate to these highs and lows. 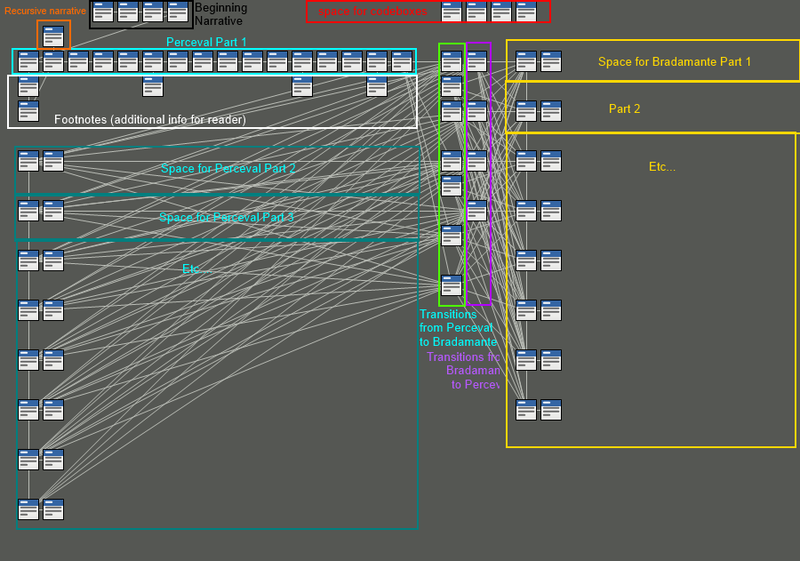 If you want to know some basic Twine code, if you’re interested in how the cat’s cradle gets formed, or you’d like to know how to get those snazzy transitions for yourself, I’m the guy (or at least, I know some places). If you’re really interested in the content, the style of the writing, and how the archetypes will interact, you might be more interested in Alex’s post. My experience with the content of the work has been minimal. I have worked in the planning stage of course, and have made plot contributions, but my involvement here is surface-level. I haven’t gone to the depths as Alex has for the project. This will probably change. I’m looking forward to contributing further to the project, and at the very least, seeing to its end, even if it doesn’t become everything we want it to be. I could say a lot about how videogames provide a new kind of digital literacy. I could talk about how videogames are a new media, one that’s gonna change the world. That all might be important later. Right now, I know we’re trying to make something interesting, something interactive, something hopefully meaningful. Lofty academic goals aren’t outside of our conversations: we have discussed aspects of alternative reality text-based games that have collaborative elements, games that require players to confer with others and share knowledge to complete. We have thought about integrating such puzzles that require students to look outside the game in order to find the answer; puzzles that make students open up their textbooks. It’s all theory now, but I’m looking forward to figuring it out in practice.